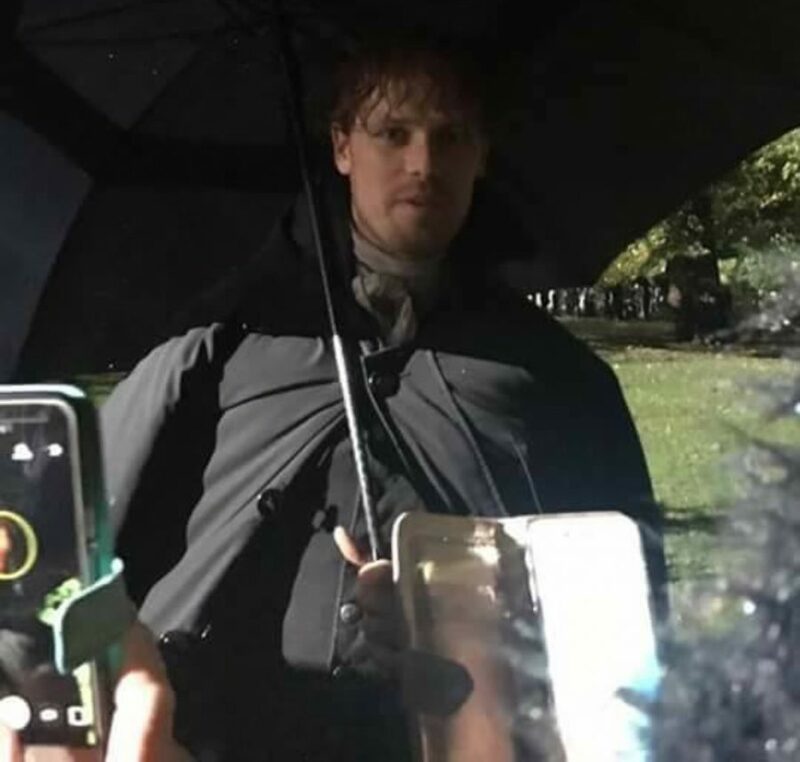 Two intrepid Outlander fans brave stormy Scottish weather to bring us behind-the-scenes shots from filming Outlander Season 4. 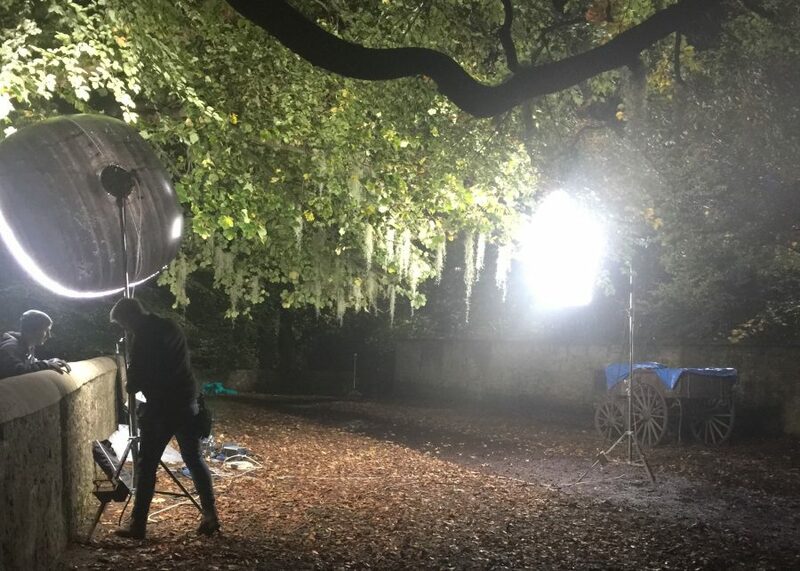 My friend Morag and I heard that Outlander was doing two night shoots in a park in a town only half an hour from Glasgow. The forecast was rain, rain, and more rain. 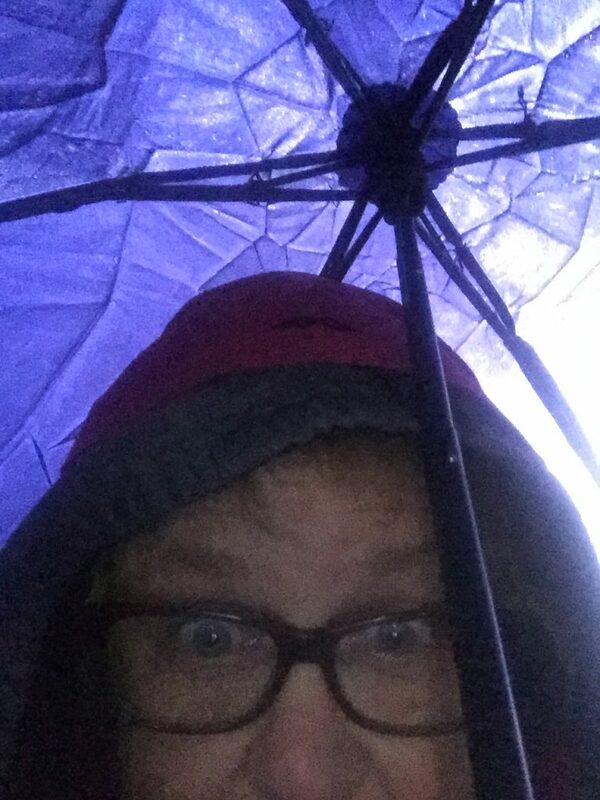 So we did what any obssessed Outlander fan would do: We assembled our wet weather gear and headed off—me complete with water proof pants, and Morag, a golfing umbrella. Obstacle one the security man wouldn’t let us through the main gate, so we wandered about looking for another way to get in. We spotted a man working on his car who directed us to another entrance, but we’d need a torch he said! So, yes, we ended up on a pitch-dark path, through dense trees, over a bridge with water running fast underneath, and ankle deep mud. We ultimately made it, only to discover that the other people who were watching had just walked in through another gate at the back of the park. No mud, no need for a torch! Sometimes I fall into the category of “born loser” and that was true again at the end …. Read on. 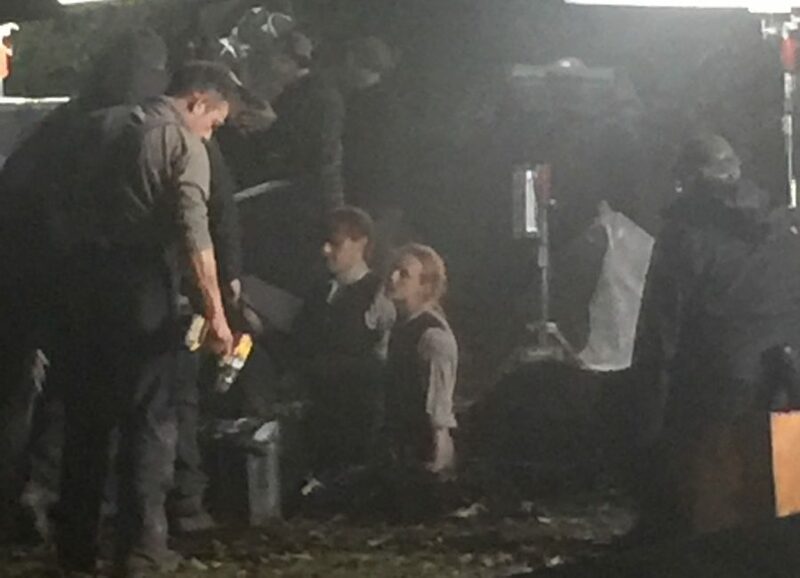 They were filming a scene well known to book readers. SPOILER COMING! Don’t read on if you don’t know or don’t want to know more about Outlander Season 4. Also, just an apology for the quality of the photos, I really must make some improvements in the camera department. Remember, readers, that Jamie and crew, after witnessing the hanging of Gavin Hayes (they featured him in Ardsmuir 303) in South Carolina, decide he must have a proper burial. Unfortunately they don’t have the money to pay for it. 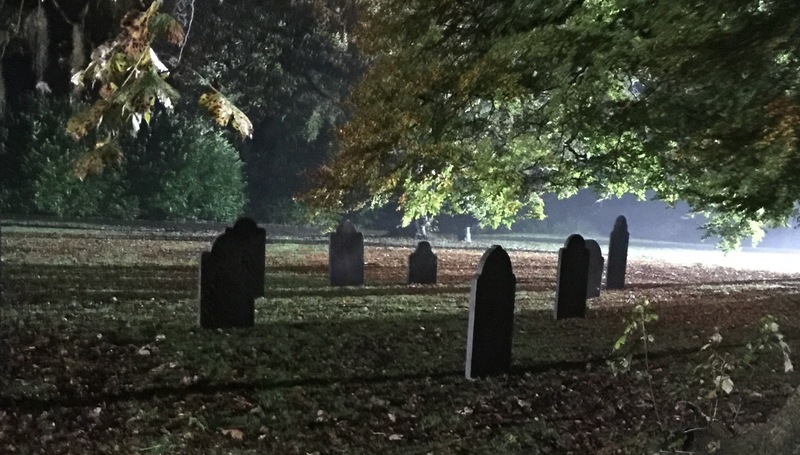 So, they sneak into a graveyard in the dead of night and do the job themselves. 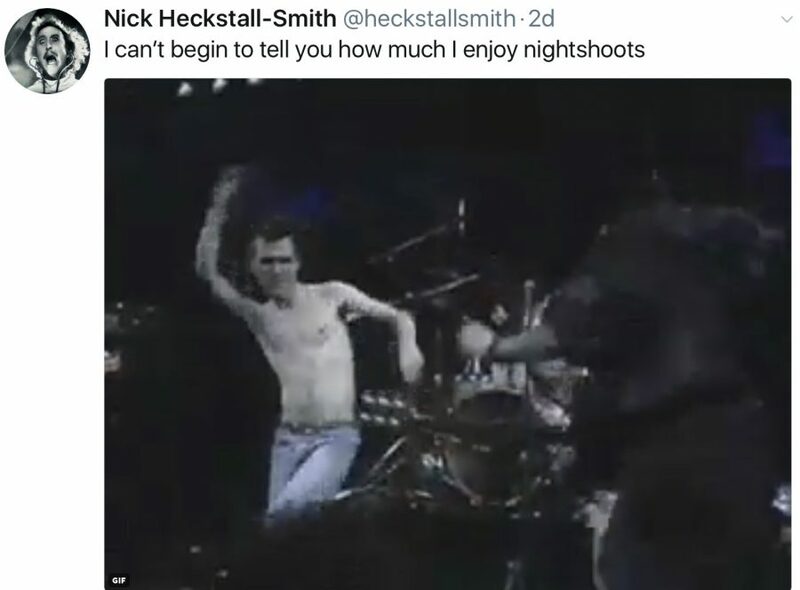 I think I remember from the book that it was a very hot night? 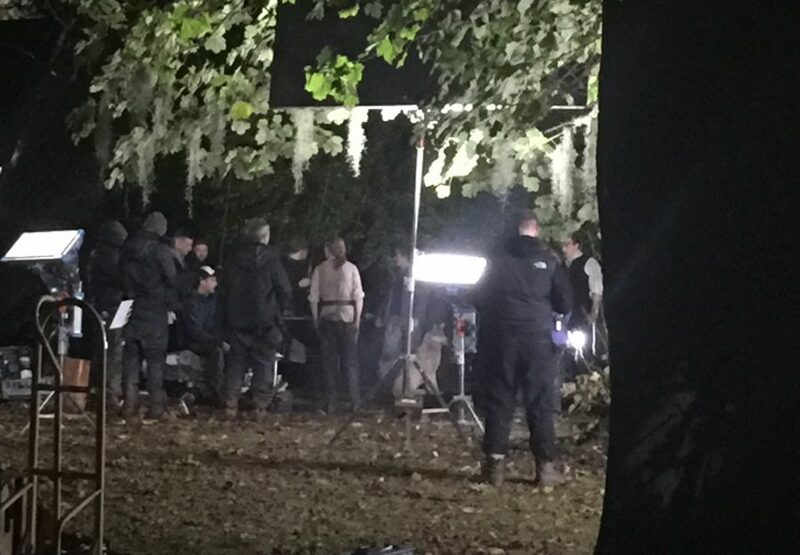 Well, they were filming that first night in pouring rain and it was quite cold. 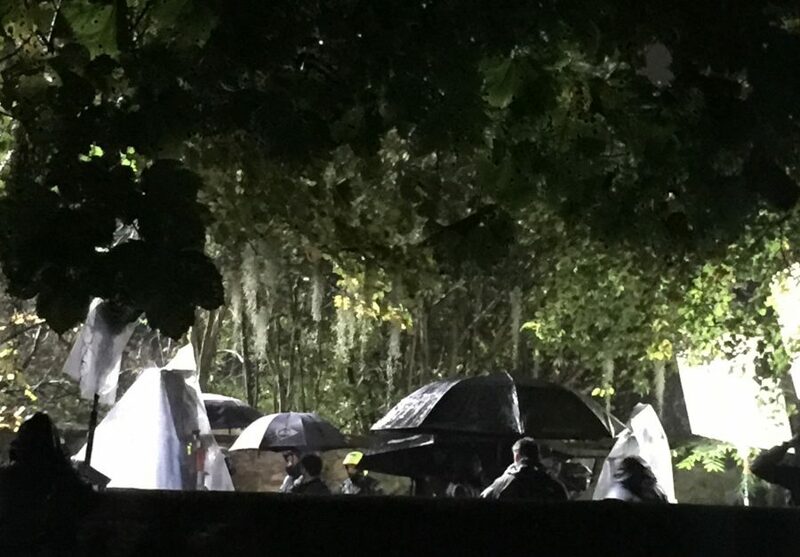 Umbrellas were held over the actors whenever there was a break, and then umbrellas away—act! 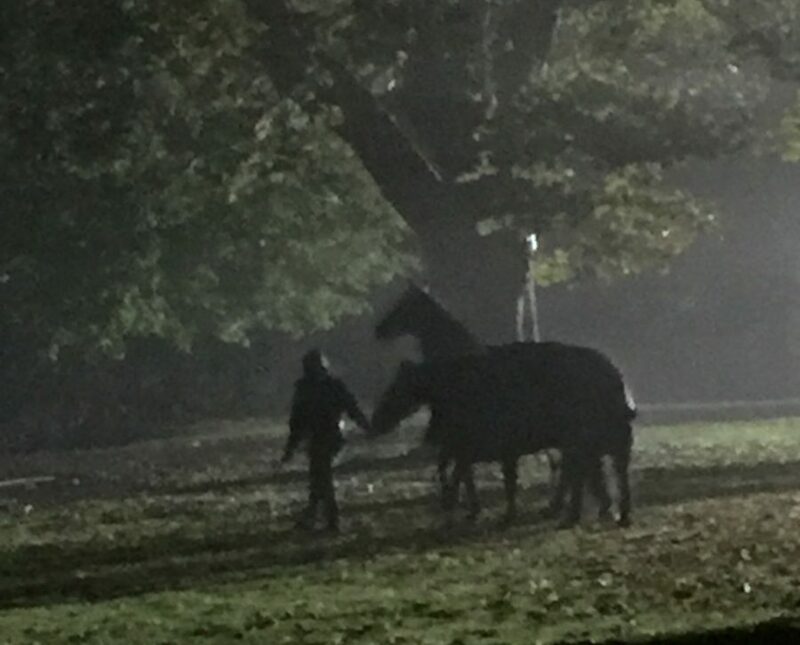 Sam, Heughan and Caitriona Balfe were there with a wagon and horses. Security folks prevented us from getting close, so we couldn’t see or hear well. But there was shouting and scuffling around the wagon, no doubt the scene where they discover their new nemesis, one Mr. Stephen Bonnet. On day two I went alone. It wasn’t raining at the start and I knew the easy way to get in. Yay, things were off to a good start. It was very different fan-wise though. Word had got around and, whereas the night before only a handful of people were watching, this time at least a hundred were vying for position. I couldn’t believe the scene I walked in on: people with dogs (all playing and barking and fighting!) and guys with cans of beer making a party of it! Let’s just say the security folks had their work cut out for them on the second night, herding us about and telling people to shut up when the cameras were rolling. I think a lot of the people were neighbors who might not even know the show. Fun fact: on both nights the birds in the trees started tweeting really loudly. Apparently the bright lights made them think it was daytime. I wonder if they will edit out those sounds? The wagon and they even put Spanish Moss in the trees . Talk about attention to detail! One man shared his binoculars with me (now why didn’t I think of that!). He told me they live next to the park, his wife is a huge fan but she sprained her ankle falling down a post-hole and had to go home for first aid. He was holding the fort, taking pics for her and preparing to report back. He’d never watched the show (what?! ), and while we were talking his daughter messaged him to say that her husband knows Caitriona Balfe and grew up in the same town! 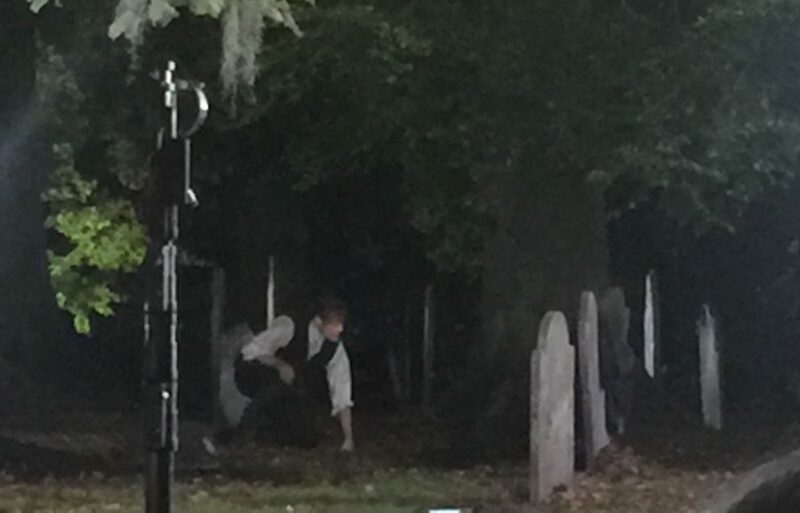 Jamie and Ian down in the grave. So, the scene the second night was the actual digging of the grave. Sam and John Bell were there, down in the grave, yes, digging! And there was some kind of emotional scene between the two. Can’t quite remember this, you can remind me in the comments below if you like. 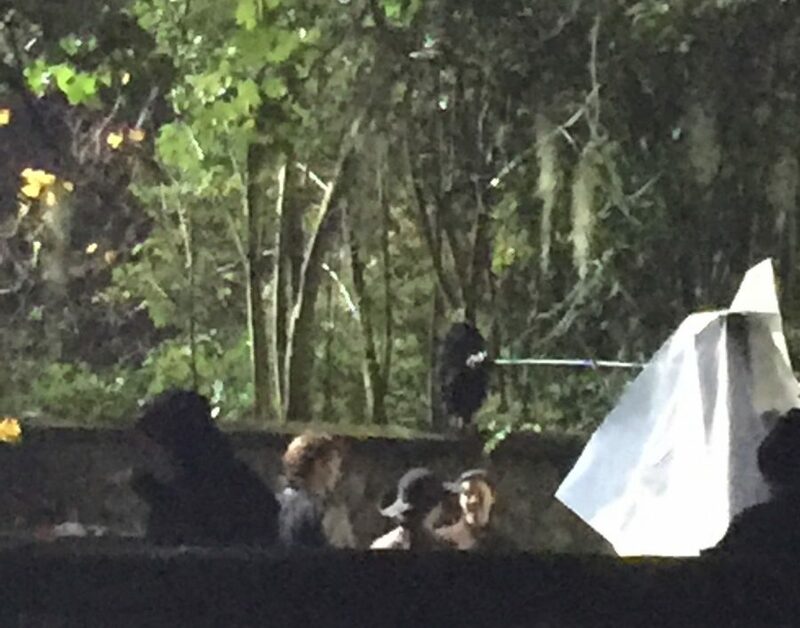 But Ian was distressed and Jamie put his arms around him in comfort. And Rollo was there! It started to rain, and nothing seemed to be happening so I decided to leave at about midnight. Bad move. I arrived back in Glasgow, looked at my messages and saw that just after I left the whole thing finished and Sam came over to the crowd for chats and pictures. Gaaaaaah! Oh well, you win some, you lose some. 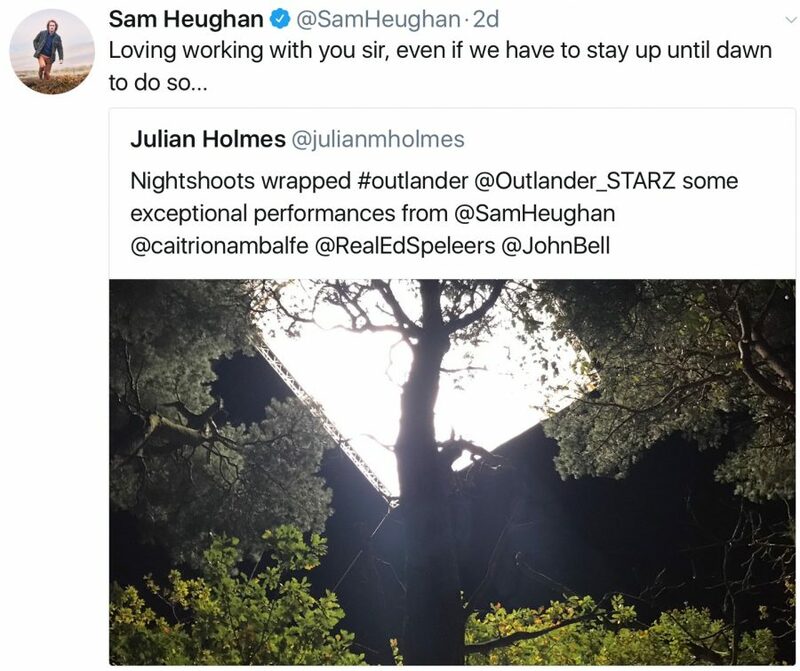 Looking forward to another time we might be able to get in on the Outlander filming action. 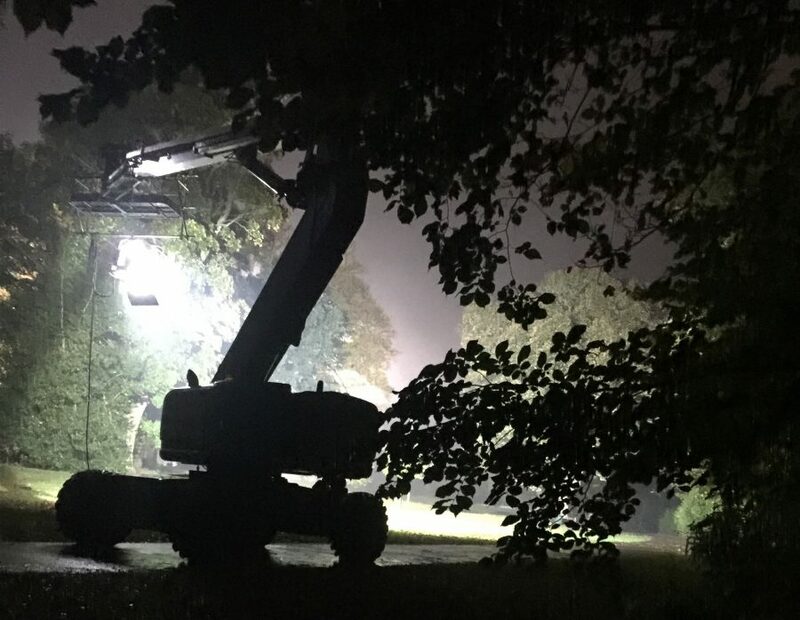 Have you had any other close encounters of the Outlander filming kind? How excited are you for Outlander Season 4? Thanks for sharing — so fun to see some of how it’s done! Thanks Teresa …. it was fun …. if a tad damp ?? Thanks for sharing. Was Murtaugh there? No sign of Murtagh …. we will just have to wonder a bit longer what became of him I guess. 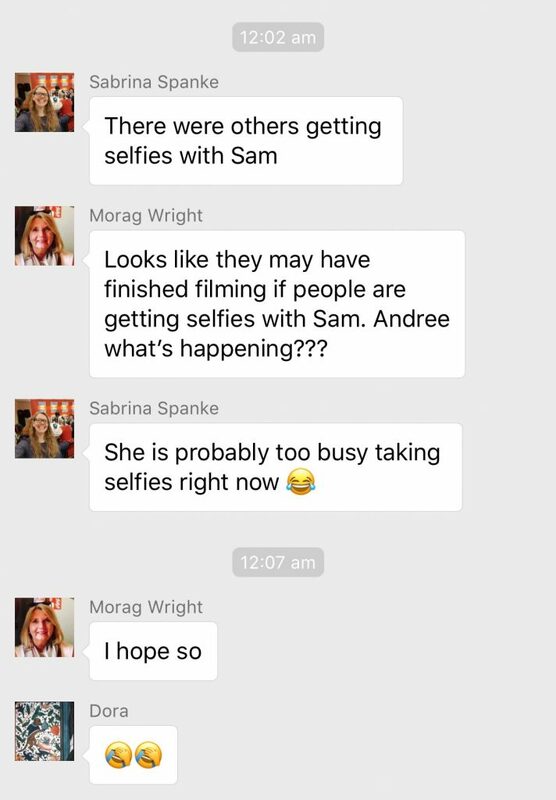 Strange that we are seeing Hayes and Lesley in Edinburgh with A Malcolm (and they’re calling him McDubh) yet they were apparently shipped off to the colonies with Murtagh…. time will tell, eh? ? You did such a wonderful job of letting us feel like we were actually there with you Andree! Loser you are NOT. Thank you! Thanks for your comment Andrea …. glad you enjoyed it …. hope I can see more and keep you posted ? Thanks for sharing your adventures with us, Andree! Wow! What an experience! Thanks for all your efforts and for sharing! Thanks Cindy …. it was a fun experience …. hope I might be able to share more with you as the S4 filming continues ? How lucky you are! I don’t know that I would have braved the elements for these but happy that you did. Thanks for sharing. glad you enjoyed it Cathy …. it was only a wee bit dreich !! Thanks so much for sharing those pics. You are most kind to think of others. Definitely not a loser. Loved this Andree,thanks so much for sharing! Glad you enjoyed it Suzanne …. hope to bring you some more season 4 filming stuff soon. According to books this finger will be very troublesome in the future and will be amputated. Any comments? I love Outlander and I have read all the books. Ah, the glamourous life of a television actor. Rain, cold, and lots of coffee. At least there’s not an early call for the next day. I’m so jealous of your close encounters but grateful you are generous in sharing them! Thank you- your commentary is precious! Oh, to live in Scotland and to be able to witness such events!